That’s the simplest way to describe the duties of these two AmeriCorps members hosted by Douglas County Partners for Student Success. Wood and McIntyre will be working with students across the county, helping young people develop plans for their post-high school education and potential careers. Erika McIntyre and Erik Wood connect with kids and families at the Sept. 24 YMCA Healthy Communities Fair at the YMCA of Douglas County in Roseburg. Wood and McIntyre have been helping to carry out the DCPSS mission since early September. For those who aren’t familiar with the name, AmeriCorps is a civil society program supported by the federal government, foundations, corporations, and other donors. Its members do public service work in the fields of education, public safety, health care and environmental protection. Members commit to full-time or part-time positions offered by a network of nonprofit community groups and public agencies. 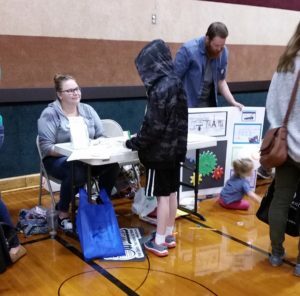 Both Wood and McIntyre understand that connecting the dots on the path from school to career can be a challenge for kids, especially those living in a rural area with fewer resources than large cities. 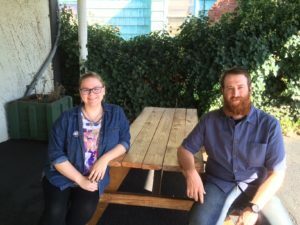 “It’s difficult for students these days to figure out a pathway to whatever education or career they want after high school, and it can be easy for the choice to be nothing or to work in the service industry,” Wood said. “A service job is not a bad thing, but it’s vulnerable, because it’s easy to replace someone in those jobs. McIntyre said it’s crucial for students to be exposed to the idea that even if they don’t come from a high-income family, it’s possible to go on to college – and that a two-year degree can be just as valuable as a four-year degree. Erika McIntyre and Erik Wood look forward to spending more time helping Douglas County students chart paths for a successful future. The two AmeriCorps members can offer some perspective on career paths from personal experience. Wood, who grew up in San Diego and graduated from San Francisco State University in 2015 with a degree in sociology. He considered joining the Peace Corps, which probably would have resulted in an assignment in another nation. “But I realized we have a lot of issues here in this country, and plenty of communities in need here,” he said. Oregon native McIntyre has lived in Stayton, Albany and Redmond, where she was doing caregiving for a family member. She attended Linn-Benton Community College for a year and was drawn to education through some child development classes. That exposure stoked her enthusiasm for working with kids and also mentoring programs, both of which are key facets of her job here in Douglas County. One of the projects both Wood and McIntyre will take part in involves developing a manual for local mentors. They’ll identify existing resources for youth, as well as the skills and training mentors need to be effective. This ultimately will enable us to establish a more formal mentoring program that will help us boost graduation rates and launch more students to gainful employment. McIntyre added the best mentors know how to listen sincerely and be able to talk over options with the kids who turn to them. We at DCPSS look forward to sharing more about the work done throughout the year by our school to career navigators. Stay tuned!